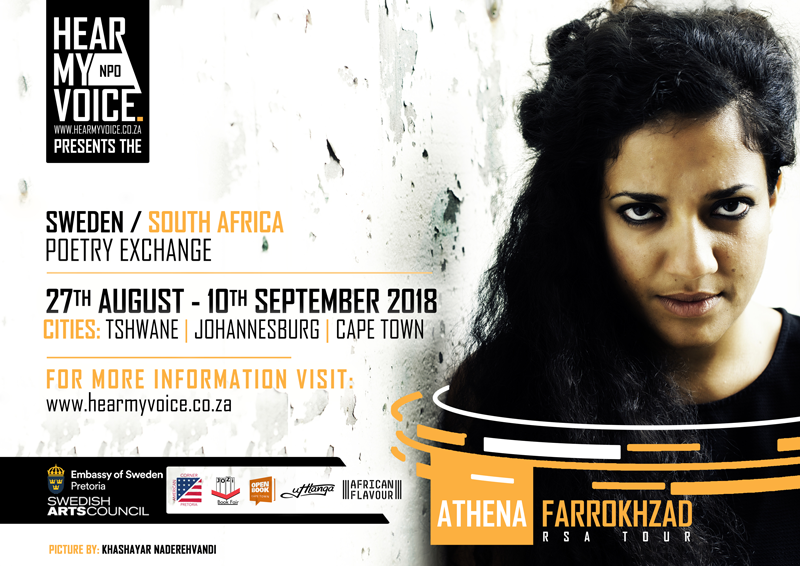 Hear My Voice is proud to announce that highly acclaimed Swedish writer Athena Farrokhzad will be touring South Africa from the 27th of August 2018 to the 10th of September 2018. She will be performing, forming part of panel discussions and conducting creative writing workshops at venues in Tshwane, Johannesburg and Cape Town including participating in the Jozi Book Fair and the Open Book Festival. A majority of the events are free entry. Athena Farrokhzad's debut poetry collection, WHITE BLIGHT, which has been staged several times as a play and translated into English by Jennifer Hayashida, circles around the topics of language, desire and heritage within a context of revolution, war, migration and racism. The collection is being released for the first time in South Africa for a 250 copy print run by Uhlanga Press in association with Argos Books in the USA. Copies will be available for sale at all the events and venues. 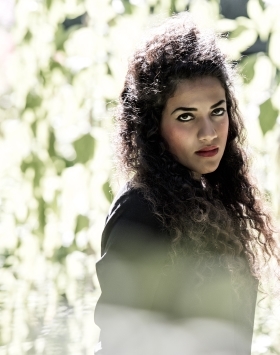 Athena Farrokhzad's South African tour forms part of the second phase of the Sweden_South Africa Poetry Exchange programme which aims to facilitate the exchange of knowledge, best practices and networks between Swedish and South African writers. Facilitated by Hear My Voice, the project is made possible by the Embassy of Sweden in Pretoria with additional support from the Swedish Arts Council. Programme partners include The Open book Festival, The Jozi Book Fair, African Flavour Books, The American Corner and Uhlanga Press. Panel features: Sweden (Athena Farrokhzad and Magnus Gustaffson) and South Africa (Jolyn Phillips). Open Book Festival: Discussion - Who are You? Athena Farrokhzad, born 1983, lives in Stockholm. Her debut collection of poetry titled "Vitsvit" (White Blight) was published in 2013 and circles around the topics of language, desire and heritage within a context of revolution, war, migration and racism. It has been translated into many languages and staged several times as a play. Her second book, Trado, published in 2016, is a collaboration with the Romanian poet Svetalana C창rstean. Farrokhzad is also a literary critic, playright and teacher of creative writing. She has translated writers such at Marguerite Duras, Nicole Brossard, Jacqueline Woodson and Adrienne Rich to Swedish.